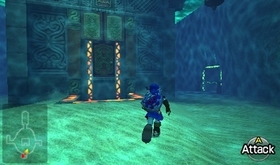 Console Creatures posted up a video showing us some of the new mechanics at work in the Water Temple. Unfortunately, most of the video’s real estate is devoted to talking about the game rather than playing it, but we at least get a live look at how the Iron Boots work as well as the new marking system pointing us to the places where we can raise and lower the water level. Another interesting thing this video shows: when selecting items, you can see a 3D model and description of the item on the top screen. Neat!